Instagram and Snapchat allow today’s teens to manipulate and ‘improve’ their own images in countless ways, from airbrushing their skin to donning masks, bunny ears, and more. 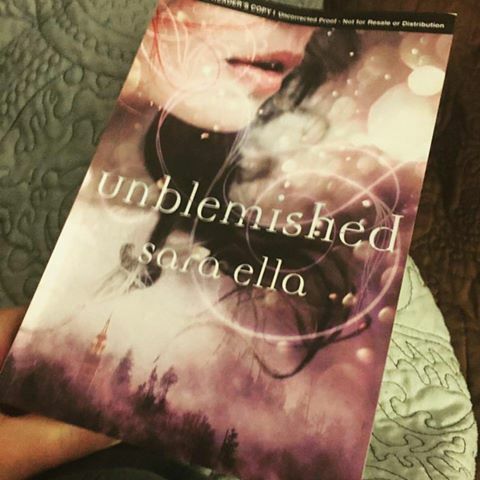 In her hotly anticipated debut novel, Unblemished [Thomas Nelson / HarperCollins, October 11th 2016], author Sara Ella gives young adult readers a story in which true beauty from within is unapologetically celebrated – and where so-called “flaws” can be the source of unimaginable power and strength. Unblemished centers on a teenage girl named Eliyana, who can’t bear the sight of her own reflection. With a hideous birthmark covering half her face, she just hopes to graduate high school unscathed. That is, until Joshua suddenly enters her life and changes her perspective. No one, aside from her mother, has ever treated her like he does: normal. Because of Joshua, Eliyana finally begins to believe she could be loved. Maybe even beautiful. Empowering, emotional and action-packed, Unblemished introduces Ella as a powerful and important new voice in the YA fantasy arena. Featuring a protagonist who, in Ella’s words, “is not your typical YA fantasy heroine,” at the heart of Unblemished are timely and ever-important messages of self-worth, inner beauty and remembering and embracing what’s real – which doesn’t include Photoshop, filtering, or letting your “flaws” get the best of you. A not-to-be-missed addition to the contemporary YA fantasy landscape, Unblemished has already begun capturing the hearts of early reviewers — and will arrive in bookstores everywhere just in time for the 2016 holiday season! I found it interesting that I would be reading Unblemished at the same time I am reading Wonder with my son. Both characters are extraordinary people with different faces. Both characters are stronger than the rest. Both characters are extremely lovable. Both characters feel ugly. That is where the comparison ends because in Unblemished we are dealing with the supernatural in a fantasy world which contains time travel, love triangles, mystery and science fiction. Personally I liked the book immediately but found myself disinterested in the first few chapters. Not sure why that is though because when I was reading it I enjoyed it but it wasn't one of those books that called to me when I wasn't reading it. What I DID love about this book was all the Pop Culture and music references. I found it fun, modern and kept me very interested and sometimes laughing at the inclusion. Unblemished is a story inside of a story and I believe many will love the many different realms Eliyana encounters on your journey to truth.